One of my all time favorite cookbooks is "Sky High: Irresistible Triple-Layer Cakes" – it’s beautiful and packed with great layer cake recipes; I’ve tried several cakes so far and they were delicious. Therefore, when I saw that Alisa Huntsman was the mind behind this book I bought it immediately – and I have not regretted doing so. Preheat the oven to 190°C/375°F. Lightly butter a 1- to 1 ½ quart (liter) ovenproof baking dish and place it on a sturdy baking sheet. In a mixing bowl, stir the granulated sugar, flour, lemon zest, cinnamon and nutmeg together. Add the peaches and toss gently to coat them with the sugar and spices. Scrape the peach mixture into the prepared baking dish. Make the sweet cream dumplings: in a medium bowl, combine the flour, sugar, baking powder and salt. Add the butter and rub the ingredients together with your fingertips until the mixture resembles coarse meal. Pour in the cream and mix lightly with a fork to form a soft dough (I needed to add 2 tablespoons of flour to the dough). Transfer it to a lightly floured surface and pat into a 1.25cm (½in) thick disk. Using a 5cm (2in) round cutter cut into individual biscuits, reworking the scraps once to make more biscuits. 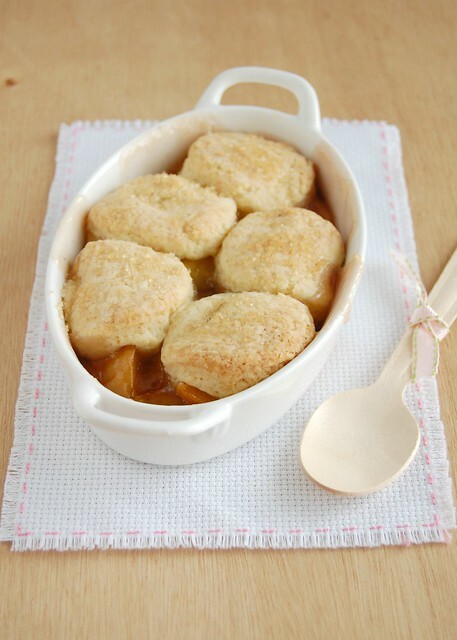 Arrange the biscuits on top of the peaches and sprinkle with demerara sugar. Bake for 45-50 minutes or until biscuits are golden and fruit is bubbly. Let the cobbler cool for 20 minutes before serving. Serve with cream or vanilla ice cream. I'm happy to hear from your thoughts about the descendants, I'm considering watching it ... Thank you for this recipe, I love cobblers ! so yummy ! I adore peaches with lemon, nutmeg, and cinnamon. Yum! Yum this looks soo scrumptious! I love cobblers and this one looks perfect. I love crumbles, but I've never tried cobblers before – this one looks delicious, but I'll have to wait until peaches are in season in the Northern hemisphere!